KSS Fire Suppression is a market leading solutions provider in Commercial and Industrial Fire Suppression. Fire Suppression is used in the protection of high value assets and KSS operates on the basis that knowledge and expertise is vital to ensuring the right product, installation and maintenance is provided in each individual circumstance to protect the asset. 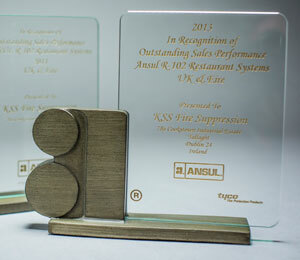 KSS has achieved many awards and accolades most notably “Outstanding Sales Performance” by a Tyco Distributor for Ireland & UK in 2011 and again in 2013. In its home market KSS has quickly become the largest Distributor of the Ansul R-102 Restaurant Kitchen Fire Extinguishing System. The range of Suppression Systems and Suppression Agents KSS offers provides its clients with an option for all circumstances. Electrical/Data — Inergen, C02, FM 200, Novec, Argonite, IG 541, Water Mist, Dry Powder. FE 36, FE13.